The few major European telecom companies generally do not defend individual rights on the Internet access, as we can notice by their opposition to network neutrality enforcement and their lack of care regarding dark zones and the "digital divide", as their investments follow their profit scheme rather than pursuing better Internet access for everyone. Recently, arguments against network neutrality as a “solution in search of a problem” have resurfaced (recently subscribed to by Mitt Romney’s campaign, recently argued by Verizon in its challenge to the Open Internet Order, and also argued here and here). People who make this argument essentially claim either (1) discrimination predicted by Public Knowledge (and the FCC) will never actually come to pass, or (2) discrimination can be benign or even beneficial. For the reasons set out below, these arguments are not persuasive, especially in light of recent examples of discrimination by service providers. Each packet is created equal in right and duty. The European Commission is holding a consultation -ending on the 5th 11th of September- about "A clean and open Internet". Citizen input is critically needed to ensure that freedom of expression is protected, against the attempts of many lobbies to impose draconian repressive procedures to censor online content. Les pages ci dessous contiennent des graphes animés et interactifs représentant la twitosphere autour du hashtag #NetNeutrality par tranches temporelles. Ces graphes sont issus d'une démarche exploratoire pour modeliser les interactions sociales sur twitter. Le projet est en periode de tests, nous explorons les possibles. Ce ne sont que des outils d'analyse, pas une analyse en soi. Virgin Media told PC Pro the company had refused to sign because it was too pro-neutrality and the agreement wasn't tough enough. It said that it was not going to sign as it stands. Virgin had no intention of discriminating or treating data differently on the basis of who owns or publishes it. Argue that forcing ISPs to carry all traffic infringes on freedom of speech. The 2011 FCC Order established net neutrality as a matter of national policy. Since, companies like Verizon have been trying to fight it. A group of well-known libertarian organizations has filed an amicus brief (PDF) to the US Court of Appeals for the District of Columbia Circuit in support of the plaintiff in the Verizon v. Federal Communications Commission case. Verizon filed its own brief earlier this month. In the brief, TechFreedom, The Competitive Enterprise Institute, The Free State Foundation, and the Cato Institute argue that the last year’s FCC net neutrality order “Preserving the Open Internet” (PDF), which took effect in November 2011, violates the First and Fifth Amendments, and that the FCC lacks jurisdictional authority to implement such a rule. Specifically, the groups say that compelling private companies to “speak,” by requiring them to carry all traffic across their networks, instead of allowing them to discriminate as they see fit, violates the principle of freedom of speech. “When you allow the government to say that a private operator has to treat all speech equally and cannot refuse to carry some speech—our view is the First Amendment jurisprudence [stipulates] that the government can’t compel a speaker,” said Randolph May, in a call with Ars on Tuesday morning. May is president of the Free State Foundation; he is also an attorney, law professor, and former associate general counsel at the FCC. Further, the groups argue, citing case law, the government must show immediate, real harm, rather than theoretical or possible harm. 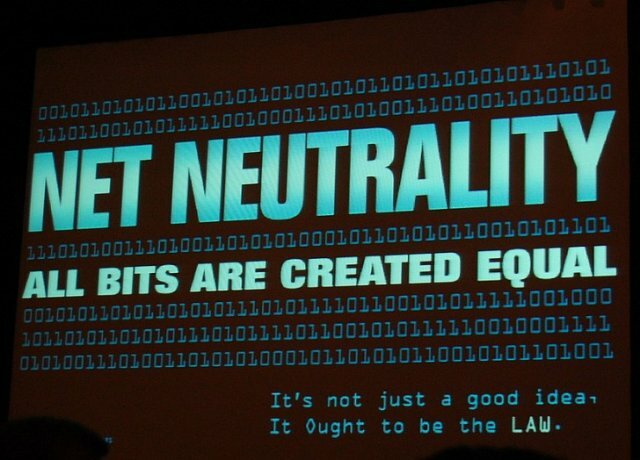 "Father of the Internet" calls this argument "flawed"
The FCC, of course, has previously argued that its actions are aimed at protecting consumers from being able to access whatever service they want over their home Internet connections. Skeptical Vint Cerf is skeptical. This appears to be a fairly broad reading of the Fifth Amendment, given that private data transiting through a private cable isn’t quite the same thing as the government taking private property to use for the public good.